Our 3D Volumetric technology brings digital content to life and helps empower people to visualise, communicate, learn and have fun in a collaborative manner with no barrier to the 3D experience. No special glasses are required. The unique and captivating visual appearance of true volumetric data, along with the interactive nature of being able to move around images in a group without wearing special glassed, makes Voxon’s technology perfect for the education sector. Interactive, 3D awesomeness allowing for multi-user and real-time interactivity. A socially engaging way to use technology for entertainment. Getting people’s attention is now easy with this jaw dropping technology. 3D interactive displays that can be used for advertising, communicating and branding. Contact us if you really want to ‘wow’ an audience. Imagine being able to explore and manipulate any medical data (including MRI) in real-time, zooming in to get a closer look, varying density thresholds, and displaying cross sections at any angle. The potential for use in medical imaging and medical training is huge. Voxon Photonics are creators of the Voxon VX1 – the world’s most advanced three-dimensional (3D) volumetric display. 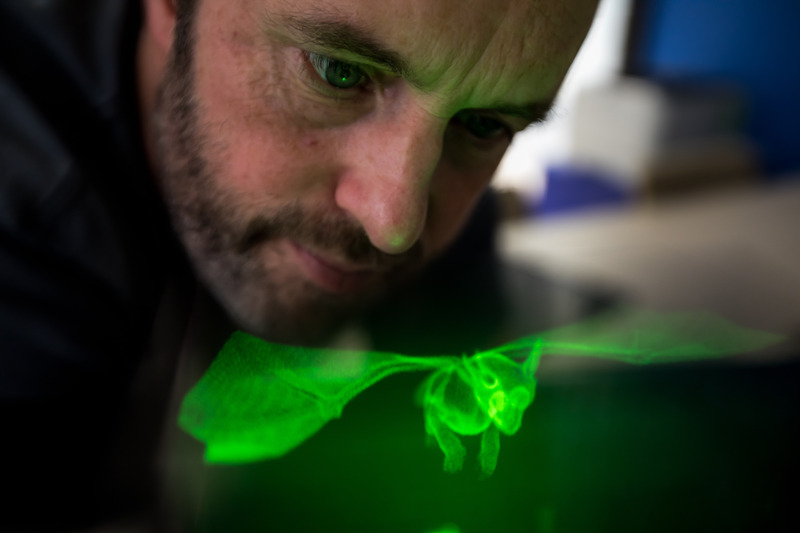 Incorporated in 2013, we have teams based in Australia and the US that have been developing the 3D volumetric technology for more than nine years. Our 3D volumetric technology brings digital content to life and helps empower people to visualise, communicate, learn and have fun in a collaborative manner with no barrier to the 3D experience, and no glasses required. Our 3D Volumetric technology is unlike anything you’ve ever seen. In literal terms, we have created a futuristic display technology capable of producing truly 3D digital images that can render animated or static imagery as genuinely three-dimensional holograms – high definition, infinitely complex and manipulable, and viewable with the naked eye from any angle. No illusions. No special glasses. The volumetric science is absolutely cutting-edge. But emotionally, it couldn’t be simpler. When people see it in action for the first time, regardless of their age, interests or background, they are mesmerised. There, right in front of their eyes, is science fiction – magic – made real. With the Voxon Photonic Engine, the Voxon VX1, we haven’t just taken 3D holographic display to another level, we’ve launched it into a whole new dimension. In technical terms, Voxon’s technology is a volumetric display. At its core is an ultra high-speed digital light engine and a highly optimized volume rendering engine. This unique combination of hardware and software is capable of projecting over half a billion points of light every second into physical volumetric space. Geometry that is being rendered is sliced up into hundreds of digital horizontal cross sections before being projected synchronously onto a specially designed high speed reciprocating screen. As the photons of light hit the screen, they are diffused and reform a physical cross sectional image at precisely the right place in physical space. Through persistence of vision, the human eye blends hundreds of layers together, and the result is a true three-dimensional (3D) volumetric holographic representation of data that can be viewed in the same way as one would view a real object, from any angle, and without special effects, goggles or glasses. Will is an inventor, innovator and expert in 3D display technology. As CEO, Will is shaping the direction of the company, liaising with industry partners and is building a grassroots community of innovators and early adopters. Tennyson is a Director of corporate finance advisory group Fortis Ago. He represents a group of high net worth investors on the Board of Voxon and assists with the commercial direction of the Company. Ken is regarded as one of the most talented computer programmers of his generation. In the mid-1990s at the age of 18, Ken developed the Build Engine used in Duke Nukem 3D, Shadow Warrior, Blood, and more than a dozen other games. He is now leading development of the core software for the Voxon Photonic Engine. Michael is passionate about optical systems and the commercialisation of new technologies. A graduate mechanical engineer with additional qualifications in physics and finance. Gavin is an Engineer, Inventor, Volumetric Data Analyst, 3D Workflow Designer, Technologist and is leading the hardware design and managing software development. Steve is a highly experienced, versatile and broadly skilled senior executive with a proven track record of bringing new technology products to market. Steve is responsible for the commercialisation strategy at Voxon Photonics. Based in New York City, Alan is a co-founder and has over 30 years’ experience building interactive holographic installations for museums. A MBA qualified manager who has extensive experience in marketing, communications, social media strategy, social media marketing and digital strategy. Lynton is now making sure the world hears about Voxon!